The World Needs A Stronger Blog...: What’s So Hard About Embalming A Pope?! What’s So Hard About Embalming A Pope?! Whilst perusing some info about humectant arterials I came across some trivia about past popes and they're hilarious embalming high jinks and mummification mishaps. I knew there was much ballyhoo amongst different faiths when it comes to the permissibility of embalming though as far as I know all the major branches of the christian faith, including catholic rites, are OK with embalming. Some bodies within Eastern Orthodoxy maintain an absolute ban on embalming, while others discourage but do not prohibit it. Traditional Jewish law forbids embalming altogether and burial is to be done as soon as possible - preferably within 24 hours. 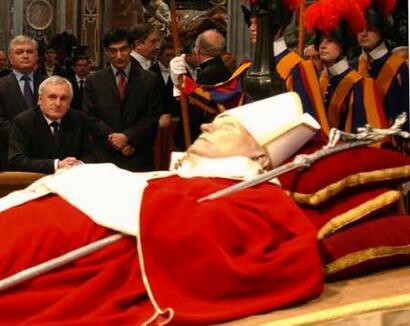 That being said, apparently and contrary to media reports, John Paul II was not embalmed before lying in state. Photographs of him clearly show the blotchiness and discoloration that is characteristic of lividity and the early stages of decomposition. Paul VI (he was the pope from 1963–1978) died in the summer. The summer heat hastened his decomposition while lying in state prompting Vatican officials to install fans around the body to disperse the odor. Pius XII's (the pope from 1939–1958) embalming was botched by a "charlatan doctor". His corpse all but disintegrating in the coffin as his body turned black and his nose fell off while lying in state! The Swiss Guards stationed around the body were forced to change shifts every 10 to 15 minutes since the body's odor caused some guards to pass out. The doctor who performed the embalming had also taken photos of the pontiff in his death throes and intended to sell them to tabloids. The Italian tabloids refused to buy the photos, and the doctor was banned from entering the Vatican City-State by John XXIII, who furthermore prohibited any photography of a deceased Pope until the body is properly vested and laid out.